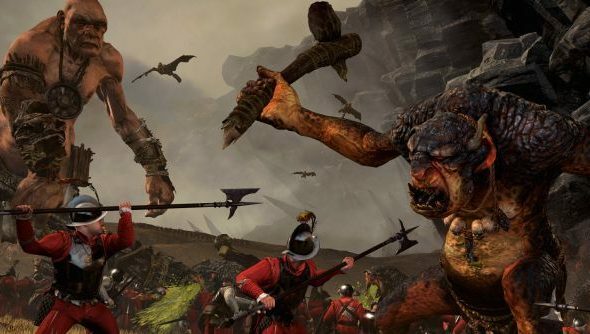 Total War: Warhammer might be the most natural pairing in all of games, bringing Games Workshop’s huge Warhammer fantasy universe into contact with Creative Assembly’s franchise of massive scale war games. Its time was less so, coming just before a major reboot to the tabletop game that moved the universe into a new continuity call the Age of Sigmar. Jeremy sat down with CA’s Andy Hall to ask what that meant for the game. The relationship between Games Workshop and Creative Assembly is obviously only just beginning, but if the game does well, clearly there’s hope for it to continue. I myself have my heart set on a Total War in the galactic sphere of Warhammer 40,000, perhaps starting as a game about the Great Crusade and running you all the way through to the end of the Horus Heresy. Just imagining that game gets me salivating, so seeing what CA and GW actually come up with will be fascinating. We just have to hope this first game is good and does well. Here’s the latest trailer, featuring dive-bombing goblins.